For courses in Research Writing, Documentation Writing, and Advanced Composition. 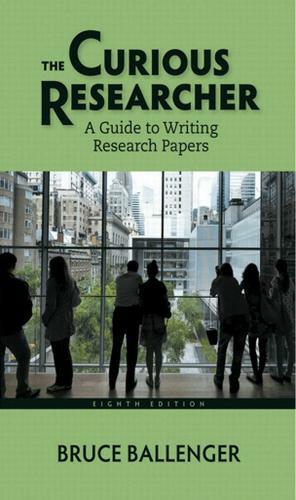 Featuring an engaging, direct writing style and inquiry-based approach, The Curious Researcher: A Guide to Writing Research Papers emphasizes that curiosity is the best reason for investigating ideas and information. An appealing alternative to traditional research texts, this popular research guide stands apart for its motivational tone, its conversational style, and its conviction that research writing can be full of rewarding discoveries. Offering a wide variety of examples from student and professional writers, this popular guide shows that good research and lively writing do not have to be mutually exclusive. Students are encouraged to find ways to bring their writing to life, even though they are writing with “facts.” A unique chronological organization sets up achievable writing goals while it provides week-by-week guidance through the research process. Full explanations of the technical aspects of writing and documenting source-based papers help students develop sound research and analysis skills. The text also includes up-to-date coverage of MLA and APA styles.